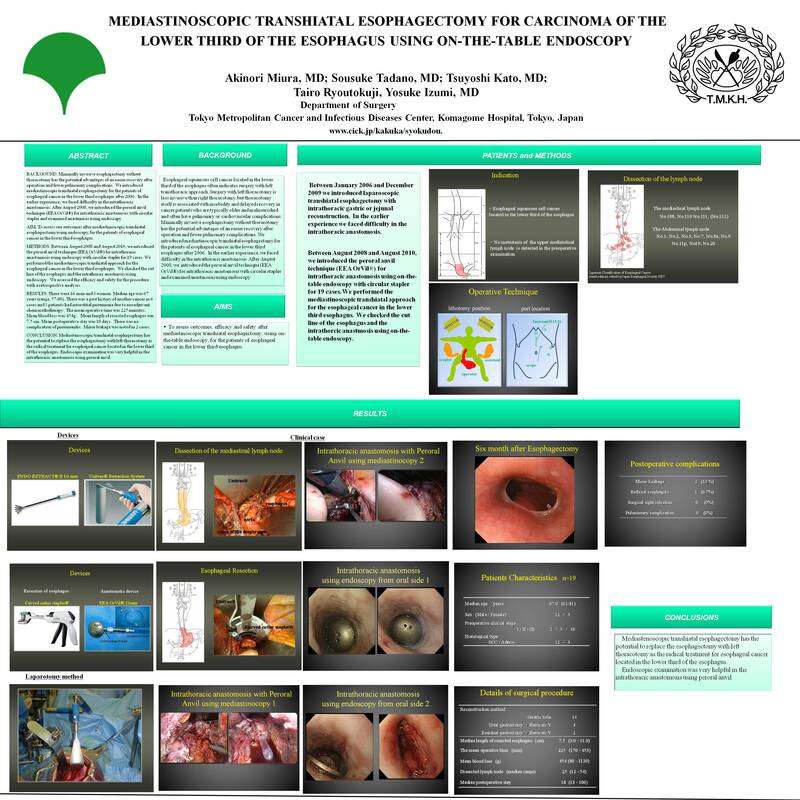 AIM: To assess our outcomes after mediastinoscopic transhiatal esophagectomy using endoscopy, for the patients of esophageal cancer in the lower third esophagus. METHODS: Between August 2008 and August 2010, we introduced the peroral anvil technique (EEA OrVil®) for intrathoracic anastomosis using endoscopy with circular stapler for 19 cases. We performed the mediastinoscopic transhiatal approach for the esophageal cancer in the lower third esophagus. We checked the cut line of the esophagus and the intrathorcic anastmosis using endoscopy. We assessed the efficacy and safety for the procedure with a retrospective analysis. RESULTS: There were 16 men and 3 women. Median age was 67 years (range, 57-80). There was a past history of another cancer in 6 cases and 3 patients had interstitial pneumonia due to neoadjuvant chemoradiotherapy. The mean operative time was 225 minutes. Mean blood loss was 454g. Mean length of resected esophagus was 7.5 cm. Mean postoperative stay was 18 days. There was no complication of pneumonitis. Minor leakage was noted in 2 cases. CONCLUSION: Mediastenoscopic transhiatal esophagectomy has the potential to replace the esophagectomy with left thoracotomy as the radical treatment for esophageal cancer located in the lower third of the esophagus. Endoscopic examination was very helpful in the intrathoracic anastomosis using peroral anvil.